Noblewoman Camilla Storm was depicted as the evil villainess obstructing the romance between 2nd Prince Julian and baron's daughter Liselotte, a fact not helped by her bad temper, sharp tongue and immense pride. 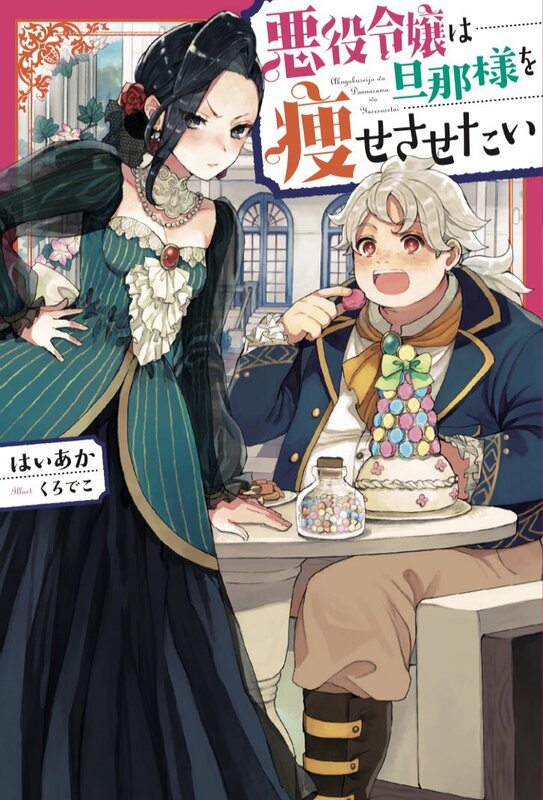 Exiled to the remote region of Mohnton to marry its obese Lord Alois as punishment, she's not only surprised by his true kind and gentle nature, but also that he might be actually handsome under all the fat. So she resolves to slim him down and return to the capital to get the last laugh, whilst learning to live in noble exile. Is MC OP? - No, MC is mentioned to be quite bad at magic. But she does have a sharp tongue and tempter to match. Is there harem? - No. Alois is OTP. Is there snusnu? - No. -Not otome isekai, but uses some plot elements. -MC is more villian-like in her emotional moments compared to similar "villianess heroines" of other works, especially when she gets angry or annoyed. Overall she's a good person though, and will fight against perceived injustice. -Main love interest is very fat, but also very relaxed and chill; a counterpart to Camilla's bouts of anger. Alois has slight amnesia and cannot remember his past very well. Apparently it ties in with the finale. -Weight loss plot part is quite understated. Most of plot is Camilla exploring and learning to live in Mohnton, which is very traditionalist and puritan. It's pretty nice story and I quite like MC. Exactly! Good Japan doesn't give a X$&# about that. Even enslaving bishoujos is trending for years now! Enslaving bishoujos is completely different matter! It's good japanese authors and studios doesn't care about being PC, but weak willed submissive heroines are just plainly boring. Especially if they know no better then actually worship random guy because he doesn't beat them. I notice this comes up a lot in shoujo manga. I suppose it ties in with the idea of the gentle, feminine beauty swept up by the strong man in charge in female fiction. Sometimes I think the authors go too far in the name of drama; they exaggerate the gentleness into timid submission, the strong man into domineering bullies. Last edited by zztop; 2019-04-15 at 01:42. As far as I remember that is part of what a Japanese man seeks in his partner, submissive, mentally unripe and that does not show superiority in front of man. That's not how "Yamato Nadeshiko" works. You got that "doesn't show superiority" part right, but she should be superior regardless. Do you know these homely nice perfectly respectful characters that noone dares piss off? That's the" Japanese ideal. I do not mean the fictitious ideal. You mean those characters that even if the opponent is an omnipotent entity, will always say something like "it's better not to make her angry"?